This is another recipe that I tried on Mother's Day. I love hot and spicy wings and since we had not had them in a bit I figured why not. DH lovingly grilled the wings until they were so nice and crispy. Yes, we like our wings really crispy. Once the wings were grilled we topped them with this yummy Asian style sauce. 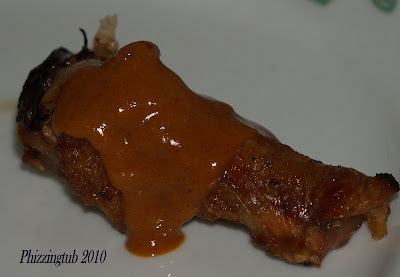 If you would like more heat, simply brush the wings with hot sauce while cooking. In a small saucepan, combine the sauce ingredients. Cook and stir over medium heat for 1-2 minutes or until smooth. Pour over chicken wings and toss to coat. Per Serving (excluding unknown items): 17 Calories; 1g Fat (67.4% calories from fat); 1g Protein; 1g Carbohydrate; trace Dietary Fiber; 0mg Cholesterol; 44mg Sodium. Exchanges: 0 Grain(Starch); 0 Lean Meat; 0 Vegetable; 0 Fruit; 0 Fat; 0 Other Carbohydrates.